The Rehearsal Studio: Wagner’s Epic Begins in Three Weeks! In three weeks’ time Richard Wagner’s Der Ring des Nibelung (the ring of the Nibelung) will return to the War Memorial Opera House. This will be the second time that Francesca Zambello’s staging of this four-opera epic will be performed by the San Francisco Opera (SFO). Traditionally, attending performances of the entire cycle has had a bit of a cult status, reserved only for the hardiest of lovers of Wagner’s music (which has always been a distinctive subset of the entire community of opera-goers). However, when plans for the return of Zambello’s production were first announced, the director observed that audiences, in general, have become more acclimated to narratives that unfold over a long span of time than they used to be. George Lucas’ initial conception of Star Wars as a narrative that fills nine full-length films almost always comes up as an example; but television has played just as important a role in extending attention spans. Think of how, on HBO, The Wire unfolded its intense narrative of the decline of the middle class (which is how Director David Simon approached the project) over the course of five seasons or, to shift to the immediate present, Billions, basically a saga of vulture capitalism, is currently playing out (with no sense of when or how the tale will end) at a gripping pace worthy of the account of the Trojan War by the Homeric bards. Furthermore, with the appearance of Thor in the Marvel Cinematic Universe (MCU), at least a few of the characters in Wagner’s narrative are likely to be familiar. Nevertheless, there is still very much a cult of those whose passion for the Ring operas is so strong that they will travel significant distances for a chance to experience the full cycle in its entirety. It should therefore be no surprise that, according to General Director Matthew Shilvock, over 90% of tickets to the three performances of the full cycle that will take place next month have already been sold. Many of those tickets have been purchased by Wagner fans, who will be visiting San Francisco explicitly to attend one of those three performances. Mind you, sales have been going on for some time. As a season subscriber, I received notification of priority availability of tickets through mail that was dated September 26, 2016. (I should add that the sale of tickets for my wife and myself was finalized in less than a month of our receipt of that notification.) However, in the face of all of that demand, seats in the Orchestra section are still available for both all three of the full-cycle performances and all twelve of the individual opera performances, through a special Web page created on the SFO Web site. Furthermore, the opera performances themselves have been embedded into a broader Ring Festival offering events both before and during each cycle. Indeed, the first of these events took place this past February at the monthly meeting of the Wagner Society of Northern California. However, many preparatory and supplementary events remain, all of which have been summarized on another Web page on the SFO Web site. In the midst of all of this abundance, I am trying hard to resist piling on too much of my own perspective of this experience. 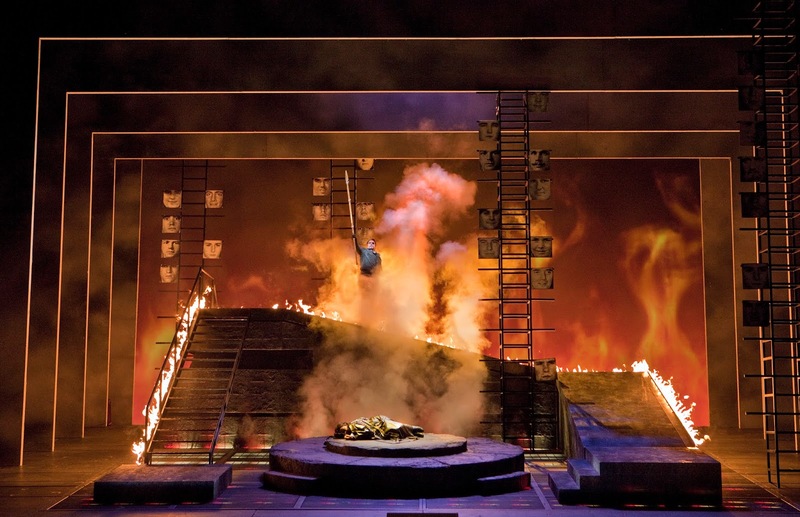 However, as a result of an encounter with a “Wagner virgin” (Zambello’s phrase, not my own), I wanted to offer a few remarks to those considering a “first encounter,” be it with the cycle, Wagner’s operas, or opera in general. My reason for doing so is based on an observation that those who know little about Wagner are often afflicted with misleading, if not inaccurate, information (better known, these days, as “fake news”). That observation arose from a personal encounter with a friend, who, in spite of avid enthusiasm for the classical repertoire, had shied away from Wagner. She had confessed that her suspicions could be traced back to the classic Warner Bros. Cartoon “What’s Opera, Doc,” which had Elmer Fudd sporting a Viking helmet while singing “Kill the Wabbit” to the theme of the “Ride of the Valkyries,” the music that opens the final act of Die Walküre (the Valkyrie), the second of the four operas in the Ring cycle. It was only after the release of Lars von Trier’s Melancholia, that I had the leverage to get her to change her mind. Film buffs may recall that this film began with the prelude to the first act of Wagner’s Tristan und Isolde played against a blank screen. After she saw the film, I asked her what she thought of the opening; and she confessed to being totally wrapped up by it. That allowed me to reply, “You know that was Wagner’s music, don’t you?,” doing my best to avoid feeling smug. Since my friend has long enjoyed going to SFO performances, her opinion shift led to some questions about whether or not it was time to get to know the Ring. I agreed with her that a commitment to the entire cycle might be more than she might wish to take as a “first contact” experience. I then explained that the last opera in the set, Götterdämmerung (twilight of the gods, perhaps more familiar to the MCU crowd through its translation into the Old Norse noun “Ragnarök”), incorporates the entire narrative, because, at the beginning the three Norns, who weave the rope of Destiny, summarize everything that has happened in the first three operas. Having given that good news, I observed, by way of “full disclosure,” that the running time of Götterdämmerung tends to be over five hours. I then explained that the shortest opera is the first, Das Rheingold (the gold of the Rhine), which takes somewhat more than two and one-half hours; but it is performed without an intermission. As a result, I came away with the sense that my friend was not yet ready to take the plunge for even one of those four operas. The bottom line is that Wagner takes his time in all four of the operas. Nevertheless, there are few moments when you feel as if he is dragging his heels. One reason is that, whatever the characters may be singing or doing, the music is always there providing a perspective on what is being observed. That music is based on a rich lexicon of themes and thematic fragments, known collectively as “leitmotifs.” These identify not only characters but also objects (such as swords), locations (such as the Rhine river), and ideas (such as the curse that is placed on the ring around with the entire plot revolves). There are even those who would argue that the leitmotifs do a better job of telling that story than the words that Wagner wrote for the libretto of each opera. As to the current production here in San Francisco, Zambello has taken some innovative approaches to setting the narrative in California in a time span that reaches back to the days of the Gold Rush (the source of the gold from which the ring is made) to a futuristic high-technology world in which the rope of Destiny has been replaced by a server farm. The result is that the visual conception of the full cycle shares with the music the ability to advance the observer through the narrative without leaving behind any feelings that Wagner was taking too long to make his point. All this means that even those who are even slightly curious should go to that Ring Web site and do some browsing. Given how the demand for tickets has progressed, there is no time like the present!